– 2011 Tour de France Déjà vu #1: Who didn’t think of MJ every time Thomas Voeckler let loose with his irrepressible tongue? – 2011 Tour de France Déjà vu #2: Who didn’t think of Snoop Dogg at the sight of Team Sky’s ‘rainforest’ team car? – 2011 Tour de France Déjà vu #3: Who didn’t think of Bob Uecker every time one of Bob Roll’s Road ID TV ads played during the Versus TV coverage of the Tour? Perhaps Roll thought he was signing up for a comic relief role. But instead he played the buffoon — a character sadly inconsistent with the brilliant early phase of his post-racing career. In those days he was one part artist and one part author. He wrote with both insight and humor. But over time television took over his personality. His literary wit was replaced by his handsy effervescence. It’s a weightless, tasteless, odorless thing. Although bubbly and substance-poor, Roll is still rightly treated as a sage and is respected by the countless fans he’s earned (including yours truly) over the years. The Road ID ads crossed an unfortunate line. Gone was Roll’s vibe of wizened veteran. In its place he became the doddering fool. That’s not the real Bob Roll. Please, Bob, never again. 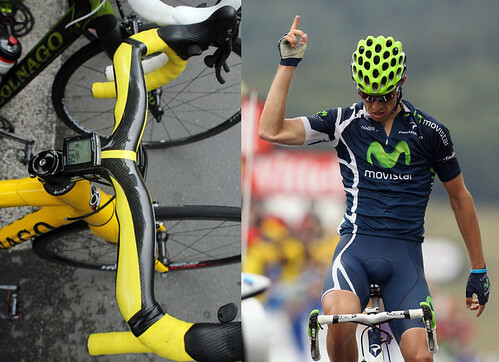 – 2011 Tour de France Déjà vu #4: The high-profile use of integrated bar/stem systems. The most famous example remains the Cinelli RAM, thanks largely to its use by the early-2000’s Team Saeco-Cannondale. Like other good things in life, its glamour was never completely obscured by its troublesome traits. The RAM was heavy, brutally expensive, largely unavailable, didn’t easily allow the use of a computer, and was a positioning nightmare. For those reasons and others, the RAM and its descendents such as the FSA Plasma and the Deda Alanera never got market traction. Thomas Voeckler’s unexpected success in the Tour de France gave one-piece systems their biggest PR boost since Mario Cipollini dressed his up. Adding to the buzz was the stage win of Team Movistar’s Rui Costa. His bar was branded MOST, which is Pinarello’s component house brand. During my recent trip to Treviso, I learned that the MOST one-piece bar is surprisingly comfortable. That’s mainly due to its shallow drop, along with its not-too-bulky wing-shaped tops and the stiffness inherent to one-piece systems. . The bar’s fatal flaw, however, is that it can’t be rotated upward to get the levers high and Belgian, but the flawless bar drop made its use endurable. Might the one-piece bar get a second chance? Perhaps. – Praise, jr.: Thank you to Nissan for sponsoring cycling, both through its commitment to Team Radio Shack, and for the fanciful Leaf commercials it broadcast during the Versus TV coverage. However, given that majority of Tour de France devotees are also car-mad, I might suggest that its marketing department direct its efforts towards tantalizing us with something we might want to buy, and/or something actually available in the marketplace. The smoke-belching alarm clocks and coffee makers in its commercials were perhaps overwrought. Guilt-tripping is not a sustainable method to sell anyone environmentally-conscious products. And in this specific case Nissan’s audience won’t offset their polluting ways by buying a rechargeable car. Most fans of le Tour do penance every day by pedaling their bikes. While doing so, they daydream about Nissans of a more ferocious breed. We understand how history is against Nissan, though. The Tour de France has a magical power when it comes to attracting bewildering car ads.